Rome: Italy’s anti-trust authority said Tuesday it was imposing a €900,000 ($1.2-million) fine on US tech giant Apple for misleading consumers on assistance services and guarantees for its products. “Sanctions of a total of €900,000 have been imposed on the Apple group after it was found responsible for bad commercial practices that harmed consumers," the agency said in a statement. European antitrust officials earlier this month launched a probe to determine whether Apple and five international publishers struck illegal deals to fix the price of e-books in Europe. Apple has also come under pressure from a bitter global legal battle with South Korean electronics giant Samsung, which accuses the US giant of infringing four of its patents with the iPhone. 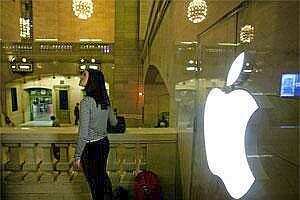 Apple reported a record net profit of $6.62 billion (€5.06 billion) in the third quarter of this year.